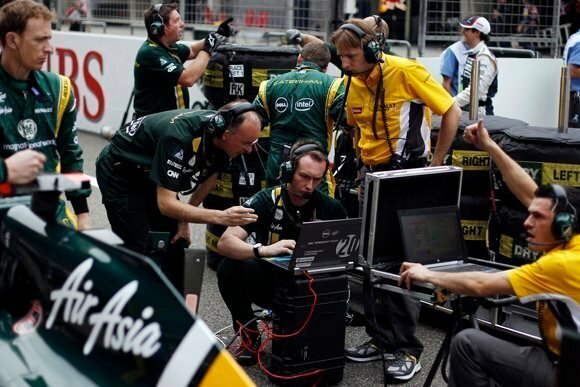 In the fast-paced world of Formula One (F1), technology is king. Designing, optimising and racing the world's speediest sports cars requires a slew of specialist equipment, including the best supercomputing power your budget can buy. Teams also need all the usual kit required to run any business, as well as powerful track-side equipment they can lug around the world. Not surprisingly, the top-performing teams tend to be those with the most money, so smaller competitors such as Caterham F1 need to think more creatively. Caterham has only been competing in F1 since 2010 – initially as Lotus Racing and then Team Lotus, before settling on its current name in 2012 after the iconic British sports car manufacturer was acquired by Malaysian entrepreneur Tony Fernandes. IT manager Bill Peters joined in October 2009, following 12 years with F1 giant McLaren. "I was only the sixth employee. We all walked into a big, empty shed in Norfolk with no IT, no people, and just six months to get a car on the grid for the 2010 season," he says. Peters knew he needed a responsive technology supplier that could provide an end-to-end solution to get the team up and running, as well as understanding its requirements and turning them round at breakneck speed. After a "quick and dirty" procurement, he chose Dell, which he says "just shone compared to everybody else". It was the start of a fruitful relationship that has been growing stronger ever since, culminating in Dell winning "supplier of the year" in this year's Computer Weekly European Datacentre Awards for its ongoing work with the team. "Initially, we needed the factory environment – all the business tools like email, collaboration, intranet, etc – plus high-powered workstations for the car designers and associated systems such as storage. We also needed a miniaturised version of the environment to take trackside. Lastly, we needed supercomputers for the factory, where we use computational fluid dynamics to simulate a wind tunnel," says Peters. 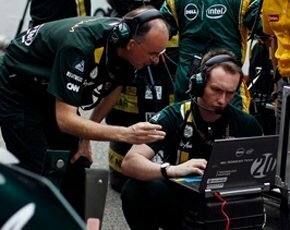 Working closely with Caterham, Dell designed and deployed everything needed to get the team up and running in just 22 weeks, including a high-performance computing (HPC) cluster consisting of 186 Dell PowerEdge M610 blade servers with Intel Xeon processors. With this, the team can perform 163,398 calculations per second and process 20GB of data on a race weekend. Its trackside environment was revolutionary. "A lot of the other teams, including McLaren, used very specialised kit, but we went for an off-the-shelf virtualised environment. That means Instead of taking five full racks of servers trackside, ours is just a single, half-sized rack. We have to ship this stuff all over the world and air freight costs are up to $250 a kilo, so reducing that has also been a real benefit," says Peters. The factory environment is also virtualised, which Peters says not only simplifies manageability, but also reduces the footprint in the datacentre to maximise space for the HPC system. "That's absolutely crucial to us as the wind tunnel simulation is by far our largest and most critical investment," says Peters. Since the initial project, Caterham has continued to work productively with Dell to improve and optimise the systems, as well as moving the entire factory environment from its former Norfolk base to new premises in Oxford. "By then we had even more processes and the whole lift-and-shift was again completed in a very compressed timeframe – just three months from the start of the project to having people sitting at their desks in the new factory. In my 30 years in IT, it's been the best project I've ever been involved with," says Peters. More recent developments of the system include making the trackside environment more resilient to the high temperatures and extreme conditions encountered when racing in hot countries, often on sites without dedicated cooling. Over the past year, much of Dell's work with the team has been around further consolidation, as well as improving availability and capacity management. While Caterham has not yet made a big splash on the circuit in terms of its race performance against bigger, cash-rich rivals, Peters says its technology is certainly helping the team to "punch above its weight". He has high hopes for the future: "In 2014 there's a big shake-up in F1 regulations that will, to a degree, level the playing field and give smaller teams such as ours the chance to compete on a more level footing. It's absolutely our ambition to be fighting in the mid-field next year. "Of course, the reason we're all doing this is to win the World Championship. I've been in that position before with other teams and, ultimately, that's what we're hoping to do."